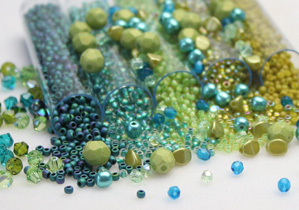 Hello Busy Beaders, Leah here from Eureka Crystal Beads! Have you seen the 2 newest shapes from the Czech Republic that we’re carrying??! You’ll want to check back to the Eureka Crystal Beads YouTube channel for the video when it gets posted in a few days or so, and I’ll also link it here for you as well when I can! Are you excited?! I’m excited. I loved making this bracelet and look forward to showing you how it’s done. At some point in the future I’ll be sure to do a blog that shows step-by-step pictures and instructions for those who want to print it out. OK…so now on to YOU and why I need YOUR help!! >>> PLEASE – comment below with you input! What would you most like to see me make (as a pattern / video) with the new Iris Duos?? Looking forward to hearing your thoughts, friends!! Previous Post Leah’s Must-Have picks for Every Bead Stash! Next Post Casual Fun: Flat Peyote with Toho Aiko beads! I would like to see earrings ! Personally, I love bracelets, that’s my choice. Love the one you’ve already created, excited for the video. Oh! do earrings! I’d love to see what you will come up with. It would be easy to repeat the pattern for a bracelet or to embellish the earring to make a pendant. I always love a nice bracelet pattern. You can just about always incorporate just a portion of the pattern to make earrings. Sometimes you can use your imagination to enhance a portion of the pattern with other beads to make a pendant. So, I guess I’d like to see you make a bracelet pattern with the Iris Duos. I like the looks of the new bracelet and I really like that you have the instructions for me to print off. I do better reading and doing the project. So please continue to have both the video and the ability to print the instruction also. Sure much easier than having to sit and write the instructions out. I have seen a lot of bracelet and earring tutorials I would love to see a pendant . I would like to see one that can be worn everyday and not just special occasions. Whatever you make I am sure it will be beautiful. I’m a huge fan of Beaded Bracelets! I tend to wear very few bead earrings as my husband bought me a special necklace and pendant for my 50th birthday, and a matching set of earrings for our 25th Anniversary. Consequently, I do bracelets – and the occasional brooch for myself. I had my 6th Spinal Fusion surgery last November, and will find out late next month whether or not we are doing it all over again. This makes beading rather difficult at times – you have to retrain your body to do all the basics again, (sit, stand, walk + RAW, Peyote, Brick, …….). The basics! Yes, Beading is one! And Leah, Love 💕 your new bracelet! I would like to see. A pendant with either the Iris Duos or storm Duos. A necklace, bracelet and earrings would be nice. Personally I like bracelets that are made of components or one motif that can be repeated. Therefore a single component can be used to make an earring and one or three components can be used to make a pendant. Although pretty, It seems we have so many bracelets…..let’s go for earrings! I hope Leah with this new ‘Artist Patterns’ that you will continue to have your own designs, color choices and wonderful tutorials. Nice that there are always new ideas but I would hate to lose your wonderful input and tutorials. Love all the colors Eureka Crystal Beads offers. I have always been attracted to color, that is how I got into beading. Also adore the Storm & Iris Duos. Can’t wait to see further ideas from you and Eureka Crystal Beads! Thank you Leah, for everything you do!! That is pretty cool you being one that contributes your own personal designs! I really look forward to each and every one of the EurekaCrystalBeads emails that land in my inbox!! Thank you so much, Leah!